During a growth spurt, your child’s heel bone grows faster than the muscles, tendons, and ligaments in her leg. The heel is one of your child’s first body parts to reach full adult size. When the muscles and tendons can’t grow fast enough to keep up, they are stretched too tight. If your child is very active, especially if she/he plays a sport that involves a lot of running and jumping on hard surfaces it can put extra strain on her already overstretched tendons. 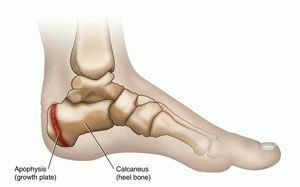 This leads to swelling and pain at the point where the tendons attach to the growing part of her heel. The good news is that the condition doesn’t cause any long-term foot problems. Symptoms typically go away after a few months. The best treatment is simply rest. Your child will need to stop or cut down on sports until the pain gets better. When well enough to return to his/her sport, have them build up playing time gradually. Supportive shoes and inserts that reduce stress on the heel bone.These can help if your child has another foot problem that aggravates Sever’s disease, such as flat feet or high arches. Stretching and strengthening exercises, perhaps with the help of a physical therapist. In severe cases, your child may need a cast so her heel is forced to rest. Can Sever's Disease Be Prevented? Once your child’s growth spurt ends, and reached full size, Sever’s disease won’t return. Until then, the condition can happen again if your child stays very active. Don't overdo it. Warn against over-training, and suggest plenty of rest, especially if she begins to feel pain in her heel. ?What are Some Warning Signs to Look for if My Child has Misaligned Feet?